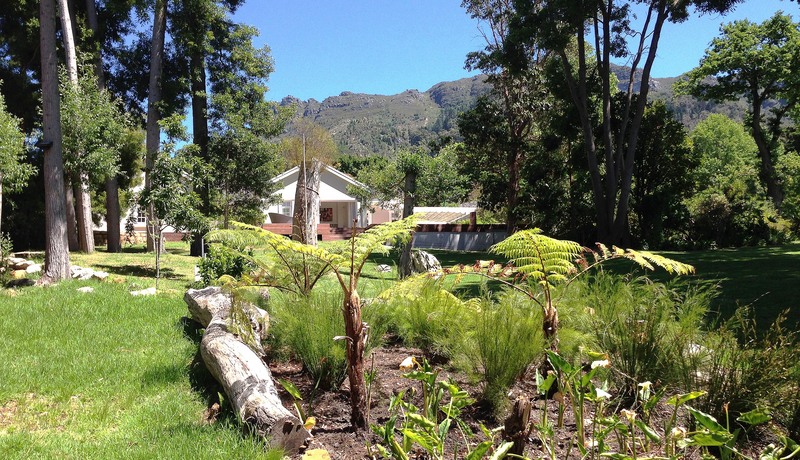 Upper Constantia is a wonderfully designed single-level and fully self-contained guesthouse at the foot of Table Mountain. 3 bedrooms all en-suite sleep up to six people, and a private pool with 150sqm sun deck provide for best outdoor entertainment. Located in one of the oldest suburbs of Cape Town, Upper Constantia is set on the most spectacular walking, running, hiking and mountain bike trails in the magnificent Constantia Wine Route District and a short 5-minute drive Kirstenbosch National Botanical Garden which is acclaimed as one of the great botanic gardens of the world. 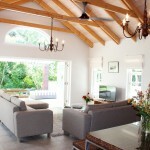 The spacious single level guest house is nestled by beautiful oak trees and has a large north facing sun terrace. From Bel Ombre Road entrance you will enjoy your own private driveway through a remote controlled gate. There is ample parking with w garages and enough space for at least 4 additional cars. Should you have any friends or family visiting, there is a pedestrian gate, which they can ring and you will be able to answer and remotely buzz them in. After entering the guest house you will find a lovely oversized north-facing terrace that partially wraps around the guesthouse on one side, and on the other side has a 150sqm sun deck with a 7x4m private swimming pool, which was added in 2014. If the sun is too much there is a draw back pergola otherwise you can soak up the sun on the outside loungers or seated around an outdoor dining table. Through the main door you will enter into the beautifully big open plan lounge, dining and kitchen area, furnished with all your could need for a night in watching DSTV on latest 3D LED Screen, or enjoying a night of cooking and entertaining. 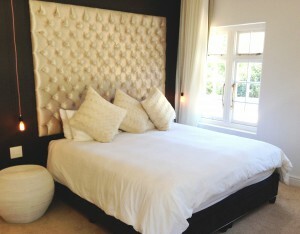 From the left and right of the living area is an entrance to each of the 3 en-suite bedrooms. All bedrooms are beautifully light. The garden bedroom has a study or make-up area whereas the other bedroom opens up to a dedicated library (with iMac and printer upon request) and then via landing into the third en-suite bedroom. This is the largest bedroom (added in 2014) with under floor heating and its own spacious lounge area. Off the back of the kitchen is a separate cloakroom to the left and to the right is a full scullery and washing machine. There is an indoor as well as outdoor clothing rack for drying your laundry. From the scullery you can get direct access to the 2-car garage and an outside store room for bicycles, golf equipment etc. Store room for bicycles, golf equipment etc. The guest house is typically serviced Mon/Wed/Fri around lunch time – our staff cleans all rooms and provides laundry service. 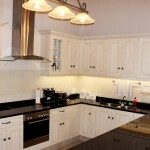 There is a dishwasher, washing machine, dryers and we expect guests to respect the fact that Upper Constantia is not a hotel but a self-catering guest house e.g. no turn down service. It is the guests responsibility to respond to our reservation confirmation with flight details and approximate arrival time. Checkin between 2pm and 4pm, and check-out before 10am unless otherwise arranged. Please also remember to SMS/email/phone when you land at the airport so that we are able to welcome you at the premises on time.